Political pundits love their metaphors, especially when they start with “B”: bases, battlegrounds, bellwethers, and, once the 2018 mid-term votes were counted, blue waves. Locally, the most surprising Democratic Party win was probably Stephanie Summerow Dumas beating incumbent Hamilton County Commissioner Chris Monzel, yet she fit a clear pattern. Democrats won a slew of offices and judgeships in Hamilton County; every Democrat running for statewide office carried the county as well, though all but Senator Sherrod Brown lost their races. So what does this mean for future elections—not just in local races but in the one for the White House, where Ohio and Hamilton County have traditionally played outsized roles? Turns out it’s tricky to measure. “The national mood can change dramatically from election to election,” says Nathaniel Rakich, an elections analyst at the political website FiveThirtyEight. “That affects Ohio as well.” In other words, raw results don’t always reveal state-level shifts. Go back to 2008 and you’ll see that the Buckeye Democrats running for the U.S. House did really well; two years later, they got crushed. But that reversal says more about national trends—basically, the Tea Party—than it does about Ohio itself, Rakich says. A smarter approach is to compare how House candidates did in Ohio to how they did everywhere else, year-by-year. From 2012 to 2016, Republicans running for the House in Hamilton County—that is, Steve Chabot and Brad Wenstrup—performed about nine points better than the average Republican congressional candidate. This means that, in both red years and blue years, Hamilton County voted more conservatively than the rest of the country. That changed in 2018. According to Rakich, Hamilton County broke Democratic in its two House races by 10.3 points—nearly two points higher than the rest of the country’s leftward tilt. Chabot and Wenstrup still hung on, thanks to their gerrymandered districts that include a number of more conservative counties. But in these races the outcome was clear: Hamilton County went blue. Things look a bit different for Ohio as a whole. 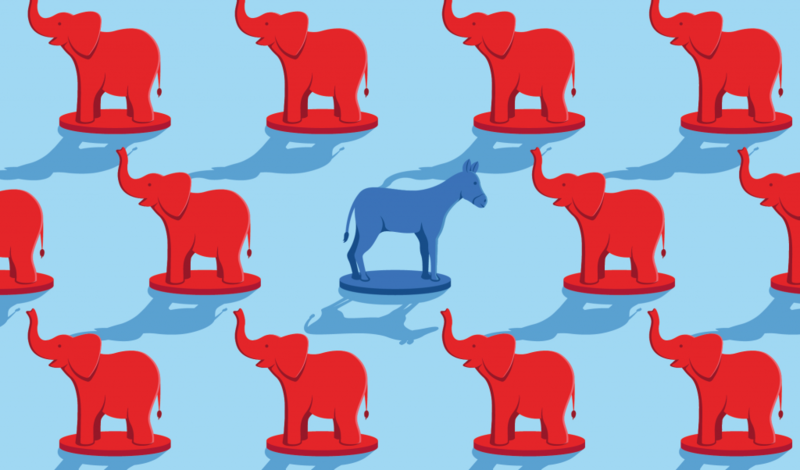 In 2014 and 2016, Buckeyes supported Republican candidates for the House by far bigger margins: an average of 14.5 points higher than the average Republican congressional candidate. In 2018, Ohio’s House results swung to the left, driven in part by blue margins in Cincinnati, Columbus, and Cleveland. But the state still leaned about four points further to the right than the rest of the country, and that sets up 2020 as a crucial test case for how red or blue Ohio really is. In 2008, 2010, and 2012, Republican House candidates did on average about five points better than their national peers, which puts those years in line with 2018. This raises the possibility that 2014 and 2016 were just dark red outliers because of John Kasich, because of Donald Trump, or maybe because of them both. Which also raises the question: What on earth do Ohio Republicans want in an executive? It’s important to keep this history in mind when reading hot takes about Ohio no longer being America’s bellwether battleground. For most of the 20th century, the candidate who won Ohio also won the presidency, mostly because Ohio mirrored the country in many ways. Whatever happens at the state level, it seems clear that a solidly Democratic Hamilton County is becoming a real thing. As Rakich puts it, “The evidence seems to be a bit stronger that Hamilton is getting bluer.” After all, big cities all around the country have been turning bluer for a while thanks to demographic shifts—given how demographics now predict how Americans vote with rigid and depressing accuracy. But step back, and the bigger picture is clear. Hamilton County (young, urban, educated) is getting bluer, while much of the rest of Ohio (old, rural, less educated) is getting redder. Forget the presidency, and look at the partisanship—on that count, Cincinnati vs. Ohio might be the best bellwether of all.